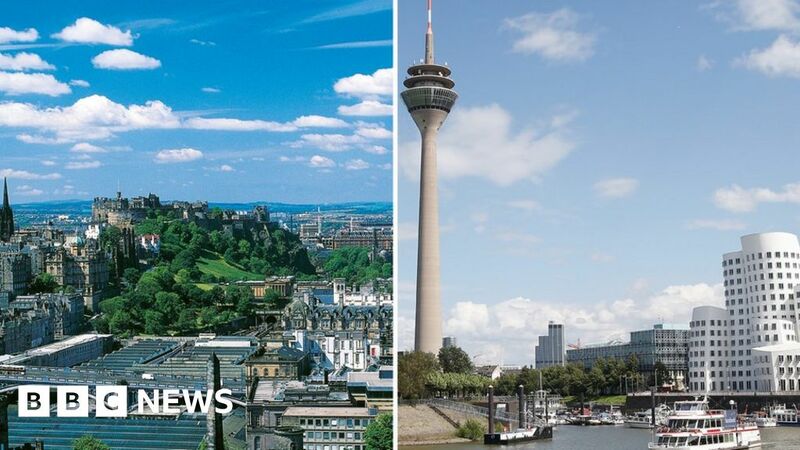 A British Airways flight destined for Düsseldorf in Germany was mistakenly landed in Edinburgh after the plane's paperwork was submitted incorrectly. Passengers only realized the error when the plane landed and the message "welcome to Edinburgh" was made. The flight is now redirected and landed in Düsseldorf, BA says. German company WDL Aviation drove the flight to BA as part of a lease. BA said it was with WDL to find out why it filed the wrong plane. "We apologized to the customers for this interruption of their journey and will contact them all individually," BA said in a statement. BA refused to say how many passengers were hit by the error. BA says the pilot had not been lost at any time, but because the paperwork said Edinburgh, the air traffic control plane had to take that route. The plane departed from London City Airport. Sophie Cooke, a 24-year-old management consultant, travels from London to Düsseldorf every week for work. She said when the pilot first announced that the plane was landing in Edinburgh, everyone assumed it was a joke. She asked the cabin crew if they were fun. The pilot then asked the passengers to raise their hands if they wanted to go to Düsseldorf. "The pilot said he had no idea how it had happened. He said it had never happened before and that the crew tried to figure out what we could do." Sophie said the plane was sitting on the asphalt in Edinburgh for two and a half hours before flying to Düsseldorf. "It became very frustrating, the toilets were blocked and they ran out of snacks. It was also really stuffy," she said. Passengers complained about the error on Twitter, with a person called Son Tran who said it felt "as an honest mistake". BA responded saying that it does not "currently have any information" as to why the flight had gone to the wrong place. The airline said its customer service team in Düsseldorf had met all the passengers on arrival and wanted Follow up with them "over time".